My name is Christopher Ewell, I’m going to be a senior at New York University next year, and I’m an International Relations and Environmental Studies double major. 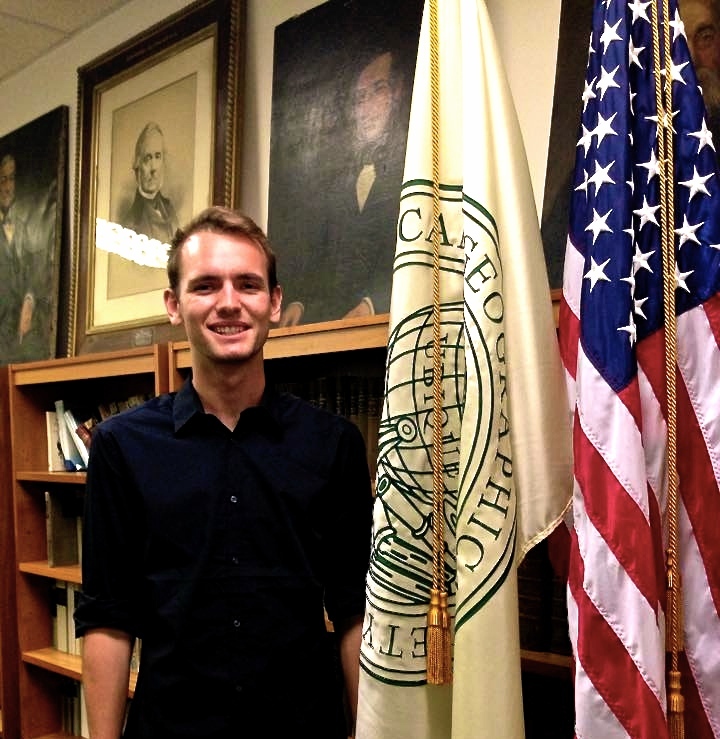 I chose to intern at the American Geographical Society because I wanted to work on analyzing and promoting awareness of how people and the environment are interconnected. This internship gives me the opportunity to undertake independent research on groundbreaking developments in geography and efforts to solve global issues, learn how to effectively present this information to the public and stakeholders, and hopefully get them to act in the best interest of our planet. AGS’s role as an intermediary between business, academia, and policy allows me to see how global issues are approached from various perspectives, from entrepreneurial start-ups to government actors, and communicate with each of them in a professional setting. I’m planning on pursuing a career researching and addressing large-scale global crises, such as climate change and sustainable ocean governance, which will require collaboration between different countries and people. The experiences I will gain at AGS in public relations and networking with regards to these issues will hopefully allow me to determine where and how I can make the best impact through my career. I’m responsible for expanding and updating AGS’s media presence by writing articles on current issues in Geography, posting interesting news, updating the website, and using mapping software to create a “Map of the Week”. Most frequently I write articles called Company Spotlights that feature a company doing innovative geographic or geospatial work, and reach out to the company for a quote, letting them know AGS is spotlighting them with the hopes of building geographic business memberships. I also write blogs on topics of my own choosing, most recently the “new ocean” that has formed in the Arctic due to climate change-induced ice melt and the resulting international governance debates. Additionally, I attend conferences as an AGS staff member such as State of the Map and Capitol Hill Ocean Week in Washington D.C. to interview key individuals about their work and build a network for AGS. My main learning objectives are to build writing, technological data-analysis, mapping, and professional communication skills in ways that can successfully engage the public, funders, and decision-makers in the environmental and social issues of our globalized world. I’ve enjoyed my time at AGS very much so far, and I’m excited to continue learning and involving myself in the field of Geography!